During the sixth century and part of the seventh Saint Augustine exercised a dominant influence in western religious life. Adalbert de Vogüé, one of the greatest experts of ancient monasticism, has been able to speak of how the legislators of the time copied the Rule, paraphrased it, or at least adapted its most characteristic ideas. This period starts with Eugipio († around 535) abbot of Lucullanum, a monastery situated in the outskirts of Naples, and Saint Caesarea of Arles († around 542), both well known in the history of Augustinian thinking. In accord with the traditionalist mentality and not very innovative of the time, both used patristic materials in the composition of their rules. Saint Augustine. Drawing by Rafael Nieto, OAR. That of Eugipio, composed at the end of his days, is a simple assembly of other texts. His personal contribution is reduced to the selection and juxtaposition. Only in very few occasions he permits himself to add a phrase, suppress another or lightly modify it. Despite this, his Rule is not without importance. For the first time a legislator was inspired by different monastic traditions in the Church – Oriental, Egyptian, African, and Italian – and had the skill to consult the most eminent representatives: Basil, Jerome, Casiano, Pacomio, Augustine, and the Master. But his preferred author is, without a doubt, Saint Augustine, whose Rule he inscribes in its entirety at the beginning of his own. Of the others he is content with offering more or less ample extracts (15). Saint Caesarea wrote two rules: Regula ad virgines and Regula ad monachos. Here we are interested only in the first, composed with difficulty between the years 512 and 534 for a monastery which he himself had founded in his Episcopal See and at the front of which he placed his sister Caesareana. It is a rule more personal than that of Eugipio. But it also takes abundantly from the patristic tradition. Saint Caesarea declares as much in the introduction. Only the desire to transmit the teachings of the Holy Fathers – statuta antiquorum patrum – has moved him, and to accommodate them in a female convent because in the female convents there are many situations which differ from that of male monasteries: quia multa in monasteriis puellarum a monachorum institutis distare videntur. Among the ancient Fathers Augustine occupies a totally exceptional place. In the central part of his rule Caesarea does not do anything else but resume the central ideas of the Augustinian text: importance of the common life; total self-surrender on entering the monastery; attention to the necessities of every religious; fraternal correction and forgiveness of faults; internalization of work; that of reading and prayer; charity towards the superior, etc. Sadly Saint Caesarea ruins too much of the Augustinian text and often he strips it of its theological spirit and at times also compromising its doctrinal context or he falsifies it with excessively local and meticulous prescriptions. The horizontal community of Augustine degenerates into a community markedly hierarchical. His moderation gives rise to a rigorous asceticism; and his insertion in the local life of the Church is substituted for a very rigid cloister, that we could well call reclusion (16). Saint Alyipus, by Rafa Nieto. Marcilla, Navarra (Spain). The meticulousness and localism of Saint Caesarea limited the diffusion of the rule to Provence and other regions of Gaul. His successor in Arles, Aurelian (546-551), reproduced it substantially in his Regula ad virgines. A little later Saint Radegunda († 587) introduced it in her convent of Holy Cross in Poitiers, from where she disseminated it to other caesarean monasteries or convents: Autun at the end of the sixth century and Jusamoutier at the middle of the following century. For this second monastery composed Saint Donatus († around 670) his rule, which is no more than a simple compilation of previous texts. Almost half of his seventy-seven chapters are inspired by the rule of Saint Caesarea. The anonymous author of Regula Tarnantensis also made use of it. This anonymous rule dates from the middle of the sixth century and proceeds, so it seems, from a monastery in the valley of Rodano, as yet not identified. It contains two clearly different sections. The first consists of the first thirteen chapters, has a prevalent practical and disciplinary character - admission of candidates, cloister, relation between the iunioresy seniores, distribution of the day between agricultural work, prayer, lectio, etc. – and is made up of materials coming from the Gallic councils and previous rules. A couple of times it cites Augustine´s Præceptum and also the Ordo monasterii. The second part covers the ten remaining chapters and is of a more theological and doctrinal style. All of it follows the course opened by the Augustinian Præceptum, whose ideas it transcribes integrally, and often with the same words and expressions. Fernando Villegas, in the introduction to his exemplary edition, has showed some of the originalities of this section and has rejected its apparent monolithic Augustinianism. But his precautions seem to me unjustified. It only separates itself from Augustine´s model in a brief chapter, the twenty first, which speaks of the care of the sick. Also keenly evident is the Augustinian mark in the Regula Pauli et Stephani, which throughout the centuries has been united to that of Augustine, and maybe needs to be for the circumstance of its own survival. Its origin continues to be uncertain. Juan E. Vilanova, who has given us a recent critical edition, is inclined to allocate its composition to Central Italy during the sixth century. It is not a complete guide which covers and regulates the whole life of a monk. It is rather a collection of prescriptions and exhortations directed at particular monasteries in a moment of disciplinary difficulties. Its doctrine comes from the Fathers of the Church, especially St. Basil and St. Augustine. From the Augustinian rule it takes its ideas on the common life, which is one of its two most impressive characteristics. Augustine´s greatest influence would be in the Rule of St. Benedict, composed in Montecasino between the years 530 and 560. The unrivalled success of this rule, converted during the Middle Ages in the code of the monks, and the comprehensible partiality of its followers has not made easy the study of its sources, and less so that of its possible relation with the Augustinian rule. Not even an expert as eminent as C. Lambot, that great expert of both rules, was able to value them sufficiently. It has been the particular merit of Benedictine, Dom Adalbert de Vogüé, to have detected in the rule of St. Benedict a good number of Augustinian reminiscences and to have commented upon them with clarity and perceptiveness. Benedict owes to Augustine “the sense of the person and that of personal relations” in the community based upon and regulated by charity. “Reciprocal differences, the spirit of service, the putting in common of goods, respect towards personal differences, love which opposes vengeance and fear, such is the climate which would establish these Augustinian influences (17). Thanks to these influences, Benedict was able to restrain the rigid verticality of the Rule of the Maestro and surround the figure of the Abbot in an atmosphere impregnated with love and evangelical service. Also the monks of Visigoth Spain would have known the rule and the Augustinian monastic doctrine, at least since from the end of the sixth century when the African Abbots Nuncto and Donatus took up residence there. Contemporary studies agree in admitting the Augustinian influence in its legislators, but differ a great deal when valuing its reach and importance. 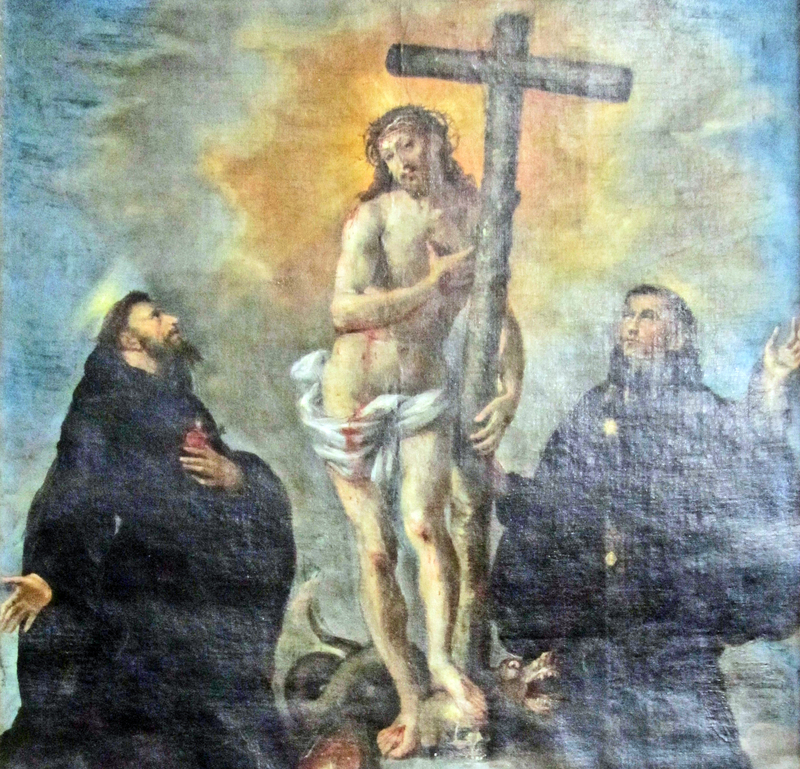 Andrés Manrique has indicated some Augustinian reminiscence in the letter which the Abbot Eutropio, the successor of Donatus in the monastery of Servitano, directed to Peter of Arcadia. There are much more profound and unmistakable signs in the rules of Saint Leonard († 600) and Saint Isidore († 636). Saint Leonard wrote his rule, or more appropriately his treatise on virginity, around the year 580 and gave it to his sister Florentina as a kind of wedding present at the time of her monastic profession. It is quite original in the organization and development of the material, but its ideas come from the previous great treatises – St. Cyprian, St. Ambrose, St. Jerome and St. Augustine – following them with absolute fidelity. Its ideas on fasting (chapter eighteen), the baths (chapter twenty) and the way of treating virgins from different social classes (chapter 27, cf. also chapter 22) are clearly of Augustinian origin. Sadly, the Bishop of Seville does not often come close to form his thinking with the clarity and profoundness of the Bishop of Hippo. Neither does he come to impose a strict common life and admits many privileges and exceptions (18). Saint Isidore was probably never a monk. But his responsibilities as Bishop and spiritual leader of his land obliged him to occupy himself at times with the monastic world. He writes on it in general works like the Etymologies and Ecclesiastic Offices; in more specific writings like the Rule, and in public actions like the Second Council of Seville (619) and the Fourth Council of Toledo (633). These interventions reveal a profound pastoral interest for the monastic life, a singular knowledge of its spirituality and organization and a practical sense not to be deprecated. The Rule, composed between the years 615 and 619, intents to guide the course of some particular monastery in his diocese with very concrete dispositions on the most important aspects of the religious life: finality, organization, liturgy, manual work, library, food and fasting, dress, correction and punishment of the guilty, possession and administration of goods, etc. It as a fairly complete synthesis, clear, with a personal and rigorist tendency, despite being composed of information from many diverse sources: the Bible, Saint Jerome, Saint Pacomio, Casiano, Saint Augustine, etc. From the Augustinian rule, which he had already used in the Etymologies (xv, 4, 46), the Sentences (iii, 46, 12; iii, 50, 5), the Ecclesiastical Offices (ii, 16, 12) and the Synonyms (ii, 43), he takes ideas about self-renunciation, the common life and fasting (chapter three), the humility of the rich (chapter four), the distribution of manuscripts (chapter eight), the transition from bodily to spiritual food (chapter nine), fraternal correction (chapter fifteen), receiving of letters and gifts (chapters seventeen and nineteen) and humanity with the sick (chapter twenty two). Some authors have sustained the influence of the Augustinian Rule in that of Saint Fructose, composed by the unpolished gothic abbot around the year 646. But the evidence provided does not guarantee sufficiently this opinion. Lastly Father Verheijen has indicated the presence of the Augustinian rule in the Liber Scintillarum, composed around the year 700 by a monk from Ligugé (Poitiers). This monk cites explicitly three texts from the Præceptum or masculine version of the Rule, presenting them with an unmistakable Augustinus dixit. He refers to the spiritual love amongst the brothers (Rule, 6, 3,), to the fraternal correction (Rule 4, 8) and the humility and service of the leader of the community (Rule 7, 3). Another important vehicle for the Augustinian monastic thinking were the regulæ mixtæ or codices regularum. In these centuries monasticism had not yet completed its evolution nor had it defined its lines and contours. It was still a phenomenon in formation, open to experimentation in forms and new laws. The monasteries felt immersed in the universal tradition of monasticism, but didn´t form groups, associations, or congregations united with common links. Each one formed an individual unit. They were governed by general legislation – imperial laws, papal decrees, council canons, - and by particular rules that the Abbot or legislator selected amongst the copious ascetic production of the Fathers of the Church. These rules did not yet have the juridical quality that they would acquire in the following centuries. They were more guiding texts of doctrine and spirituality. In many monasteries various rules coexisted, amongst which the Abbot chose the norms that he considered to be most appropriate. This variety and indeterminacy was the cause of no little confusion and moved some Bishops, like Saint Caesarea or Saint Isidore, to draw up clearer rules which were briefer and better structured. Frequently they were reunited in a single codex, the liber regularum, which, at least in Spain, the Bishop handed over to the Abbot in the moment of his blessing: "Receive this book of the Rules so that you order in holiness your life and that of your subjects - accipe hunc Librum Regularum, studens ad tuam vel ad subditorum disponendam sanctissimam vitam" (19). These codices or corpora regularum existed in all the countries of Western Christendom. The Benedictine Anscari M. Mundó, who has dedicated various decades to their study, has determined four groups, belonging to various monastic surroundings: “the Italian pre-Benedictine, or more appropriately not Benedictine, the Frankish-Merovingian and Irish with Columbine norms, the Hispanic-Visigoth and Narbonne associated with Isidore and Fructose and the Carolingian (20). A good number of these codices contained the Rule of Saint Augustine. In fact the most ancient manuscripts which we have of the Rule all form part of the collections of various rules. The most ancient belongs to an Italian codex regularum, el Parisinus latinus12634, already mentioned in the treatment of the Rule of Eugipio. Also they passed on two codices regularum from the beginning of the ninth century: the Monacensis clm22118, of Hispanic-Narbonne origin, which contains the codexof Saint Benedict of Aniano, and the Lambacensis 31, belonging to the Germanic monastery of Münsterschwarzach. The oldest manuscript is the female version of the Rule, the Scorialensis a. i 13, which is also a collection of Rules, copied it seems, in a Castellan-Leones monastery at the beginning of the tenth century. The Augustinian rule also included two codices regularum, now lost, that had been written in the Castellan monasteries of Arlanza and Cardeña during the tenth century. During the seventh and eighth centuries Western monasticism became gradually closer to the Benedictine model. Charlemagne (768-814) accelerated this process which came from Gregory the Great (590-604) and had been supported by the Lombard kings and English monks. In the year 787 the Abbot of Montecasino obtained a copy of the original Rule of Saint Benedict and on this constructed his monastic reform. Ludovico Pio (814-840) continued this same line, and with the help of Saint Benedict of Aniano († 821), he imposed it through the Capitulare Monasticum on the monks of the Empire in the Council of Aquisgrán (817). The triumph of the Capitulare Monasticum was not, however, as rapid and absolute as at times it has been believed. Italy ignored it almost completely, whilst it is certain that many of the monasteries were already governed by the Abbot of Montecasino. Rome still stayed faithful for a century and a half to the older monasticism, and only opened to Benedictininismo during the rule of Prince Alberico the Second (932-954) and through the repeated visits that Saint Odon of Cluny realized to the city between 936 and 941. Nor in the Iberian Peninsula did it have greater repercussion, aside from the Hispanic Mark and some reduced parts of the Navarra and the Rioja regions. Linage Conde, who has studied this and other Benedictine questions with an equal measure of sympathy and competence, has summarized neatly its thinking in the following phrases: “The Benedictine Rule, as an exclusive rule of life, started to appear during the tenth century in some monasteries in Leon, Castilla de la Rioja, with no evidence in Asturias until 1042 in San Vicente de Oviedo and in Corias; in Galicia (save a possible period in Samos in 960) until 1077 in San Pelayo de Antealtares of Compostela; and in Aragon and Navarra until San Juan de la Peña in 1028 and Leire and Irache in 1032 and 1033, already in the period of the Cluny influence of Sancho the Elder” (21). This progressive affirmation of the Benedictine Rule was displacing that of Saint Augustine and his Rule for the monastic life, but the monastic world did not monopolize the canonically organized religious life. There existed outside of the Benedictines the vast world of the Canons. The term canonicus, which appears for the first time in the Synod of Clermont in 535, did not have in this time any connotation of ecclesiastical dignity. It denoted, it appears, a cleric assigned to a local Church, who served under the immediate direction of the Diocesan Bishop, in contrast to the clerics who administered Churches and Monasteries and feudal Lords or those who lived leaderless and immersed in ignorance and laziness. These clerics tended to serve Churches of certain importance, were celibate, ate at the same table, slept under the same roof, recited together the liturgical hours and put in common use their goods. But their juridical state and their spiritual profile were not sufficiently defined. They often suffered the influence of the spirituality and legislation of the monks, from which it was not always easy to distinguish them. They lacked sufficiently structured rules and they governed themselves by rules taken from norms in Scripture and the Fathers of the Church. Their most notable feature has to be found in their belonging to a particular Church (22). The Rule of Saint Crodegagno († 766), written around the year 755 for the clergy of his diocese of Metz, marks an important milestone in the definition of the professio canonica, insisting in the liturgy and the service of a particular Church. But this did not acquire its definitive formulation until the Council of Aquisgran (816). It was the institutio canonicorum or Canonical Rule compiled in this Council that defined the canonical ideal, marking it out from the monastic and dictating a series of disciplinary norms of universal outreach on their daily life. The institutio consisted of one hundred and forty-five chapters, of which the greater part (1-113 and 126-130) are texts from Saint Jerome, Saint Augustine, Saint Gregory the Great, Saint Isidore or council decrees on the life and spirituality of priests. These practical norms come, generally, from the Rule of Crodegagno, and through it that of Saint Benedict. Among the patristic texts we find complete the sermons 355 and 356 (chapters 112 and 113) of Saint Augustine and ample extracts of 46 (chapter 12), as well as Augustinian passages from Julian Pomerio (107-110, 120). There is no sign, however, of Augustine´s Rule. This is probably because the complier could tell that its lay character was out of place in a clerical document. But already in the second half of the ninth century some canonical circles in the north of France, unsatisfied with the 115th chapter of the institution which accepted private property, returned to the Augustinian Rule with its center on the religious life in terms of the perfect common life and poverty or self-renouncement. Hincmaro de Rheims († 882) gave to the cathedral chapter of St. Mary´s a manuscript, the actual Remensis 392, with the Rule of Saint Augustine coming from the treatise De sancta virginitate. From the same time comes the Laudunensis 328 bis, which comes from the Cathedral of Laón. Another manuscript from the time, the Vaticanus palatines 211, is closely related to the Laudunensis 328 bis, “combining for the first time the Rule of Saint Augustine with the sermons 355 and 356” (23). Verheijen notes that these manuscripts appear at a time and in a region in which certain clerics yearned for the perfect common life, and had even come to forge false papal letters in support of their desires. The canons always looked at Saint Augustine with special predilection. Among their Fathers and Masters they counted on Saint Eusebio of Vercelli, Saint Ambrose, Saint Isidore, etc. But the great architect and legislator of the canonical life of the clerics was always the holy Bishop of Hippo. Above all for his sermons 355 and 356, inserted in the Rule of Aquisgran and which they knew under the title of sermones de vita et moribus clericorum. This esteem grew during the Gregorian reform, one of whose principal aims was precisely the introduction of the perfect common life in the Chapters. Leitberto of Saint Rufo († around 1110), who goes back to Jesus Christ for the origin of the Canons, attributes the juridical legislation to Saint Augustine. These same ideas found their echo in Urban II (1088-1099) in a bull to the canons of Saint Rufo. 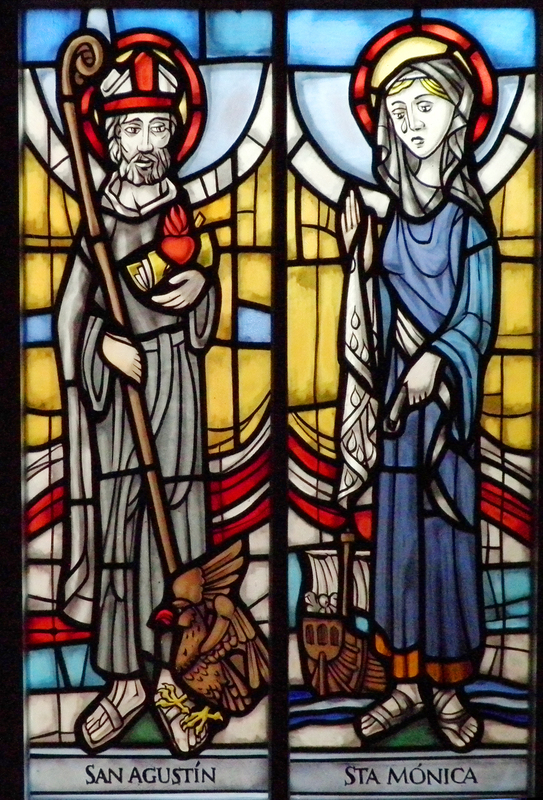 Saint Augustine and Saint Monica. Glass window. Salamanca, Spain, 2010. In the Council of Lateran in 1059 Hildebrand, the future Gregory VII, denounced with violence the decadency of the canonical life, which attributed to the rule of Aquisgran the existing contradiction between the doctrinal principles in the first part and the practical norms in the second part. Their tolerance of private property (chapter 115) and the amplitude of allowances (chapter 122) were responsible in the greatest part for the disorder to which they had arrived. As a remedy it was proposed a return to the ideal of the early Church and the substitution of the chapters incriminated for others much stricter. But neither Pope Nicholas II nor the Council accepted fully these desires. The Council limited itself to proclaim a canon which imposed upon the Canons a common table and dormitory as well as putting in common their goods and exhorting them to recuperate the apostolic life: “we pray and exhort that you would apply with all seriousness the achievement of the apostolic life, that is to say, the common life: rogantes monemus ut ad apostolicam, scilicet secundum communionem, vitam summopere pervenire studeant”. Identical ideas were aired, and with more passion, by Peter Damien (1007-1072) and other promoters of the reform. Peter Damien argued expressly the doctrine and the words of sermon 356 in his diatribe contra clericos regulares proprietarios. Very quickly the reformist campaign resulted in concrete projects and initiatives. Their appeared editions without the Rule of Aquisgran, and they composed other new ones and there surged reformed canons of all parts according to the new directives. Three codices from the second half of the 11th century, conserved now in the Vatican Library, transmit the first adjustments of the Rule of Aquisgran to the new demands. All three omit the incriminated chapters of 1059 and they substitute them with norms coming from the Rule of Saint Benedict or the patristic tradition. With these reforms starts the rapid decline of this rule, so well documented in the manuscripts of the 12th century. As an example we have the regula sanctorum patrum Augustini, Hieronymi, Gregorii, Prosperi atque Isidori from the manuscript B/28 in the Civic Museum in Pavia. It consists of sixty-two chapters, of which only thirty-two come from the Rule of Aquisgran. The 115th chapter has given way to ample extracts from Augustine´s 355th sermon. The codex transcribes the Præceptum or masculine text of the Augustinian Rule in the pages immediately following that of the Fathers of the Church. Saint Augustine, Crucified Christ and Saint Nicholas of Tolentine. Oil painting. Augustinian Recollects Monastery, Serradilla, Caceres, Spain. The new Rules start to appear in the last third of the 11th century. The first two are anonymous. One has been attributed, though it appears erroneously, to the same Gregory VII and the other to Saint Anselm of Luca († 1086), one of his most distinguished collaborators. Both prescribe the perfect common life and insist in the ascetic values of the religious life. Saint Anselm, whose legislative activity had already been recorded by Bonizo de Sutri († 1089/1095), cites Saint Augustine thirty-two times. Other communities already adopted the Rule of Saint Augustine; in 1067 by some canons of Rheims and in 1071 by those of Saint Florien in Bavaria. Much earlier is the manuscript Parisinus latinus of 1877 in the National Library of Paris, coming from a community of canons that, according to Dom Missone, were already governed by the Rule of Saint Augustine. Missone believes that the manuscript proceeds from the community of Saint Rufo de Avignon founded in 1039 by four canons from that Cathedral (24). Others bring forward its composition to the first decades of the century. In whichever case, the manuscript proves that a community of canons was already governed by the Rule of Augustine in the first half of the 11th century. The expansion of the so-called Order of Saint Rufo from the south of France and the north-east of Spain, as well as their influence in the reforms of Saint Victor of Paris and Marbach of Alsacia, favoured the diffusion of the reform and the Augustinian ideal for these regions. The Spanish foundations started with the implantation of the Jaca Reform (1076) and followed with that of Saint Mary of Besalu (1084), Rieuls (1086), Saint Afrian of Besos (1092), Taragona (1094) and Huesca (1096). 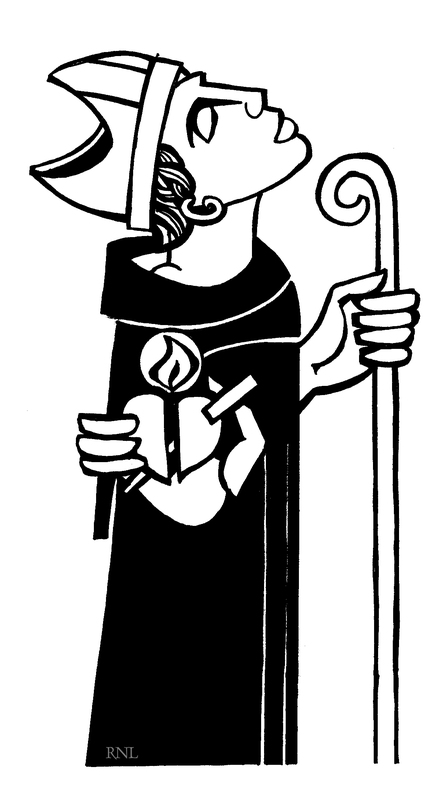 The Synod of Vilabertran in the year 1100 imposed on the canons of the locality the Augustinian perfect common life: “We determine that the canons of this Church endeavour to live according to the Rule of Saint Augustine, as one who having nothing possesses everything: decernimus ut clerici in eadem ecclesia manentes canonice secundum regulam sancti Augustini vivere studeant, tanquam nihil habentes et omnia possidentes” (25). This Chapter, situated on the outskirts of Figueras, had been founded by Pedro Rigalt in 1065 and he was an Augustinian at least from 1089. Other Spanish canonical communities came to Augustianism by way of the local people: Tremp in 1079, Mur in 1098. According to Manrique, who follows A. Legarde, the first Archbishop of Toledo, Bernardo of Sedirac (1086-1124), would have imposed on his canons the Rule of Saint Augustine. But it is more likely that the Archbishop coming from the monastery of Cluny would have formed with his clerics a Benedictine type of community. During the last decades of the eleventh century and the first decades of the twelfth there was a proliferation of the foundations of the canons regulars in France, Italy, Belgium, Spain, Portugal and England. Many depended upon a mother house, or at least, had received from them inspiration or momentum. I will now mention some of the most important. In France they appeared that of Arrouaise (1090), that in 1107 had already accepted the Rule of Saint Augustine and did not delay in spreading throughout Belgium, England and Ireland; that of Saint Quentin of Beauvais, founded around the year 1078 by Ivon of Chartres (1040-1115) the great inspiration of the regular life of the canons, and to whom he impregnated the Augustinian spirit; and that of Saint Victor of Paris, organized around the year 1110 by William of Champeaux († 1121), the famous master of Notre-Dame. In Germany there emerged those of Rottenbuch (1075), in Bavaria; that of Marbach (1089-1090), in Alsacia; and that of Springiersbach (around 1106), in Renania. In Italy they reached a certain strength those of Saint Mary “in porto” from Ravena, whose constitutions, drawn up around the year 1116 by Pedro Pecador or Honestis, were imitated both in and outside Italy. The first king of Portugal, Alfonso I (1128-1185), organized the congregation of Holy Cross of Coimbra in 1132 (26). But not all of the canons shared this enthusiasm for individual poverty and the perfect common life. The members of the Cathedral Chapters and the great collegiate churches preferred to stay faithful to their ancient customs. The reform propagated itself above all through new foundations, in which frequently collaborated bishops, lay faithful and particular canons. Other times their implantation divided the communities and gave way to discrepancies, tensions and rivalries that upset the clerical world. Those who saw in the Rule of St. Augustine a sufficient enough base in order to construct upon it their religious life rejected the reform, and in a second moment lost their religious identity until becoming absorbed with the secular clergy. The reformists accentuated the ascetic elements and, on converting themselves into regular canons, relaxed their links with the local Church and every day become closer to the monastic model. The regular canons directed their eyes to Saint Augustine in search of light and inspiration. At the beginning they only saw in him a point of reference, a bright light that would show the way, as no one like him had known how to interpret and incarnate in his community the apostolic life. They wanted to follow his example, committing themselves to put all things in common, sometimes even adding that they wanted to live secundum Regulam sancti Augustini. But this clause does not indicate that they had already adopted his Rule as a standard form of life. It only demonstrates their intention to configure their lives according to the Augustinian model, in the way and manner that he had done with his followers. It shows in effect that some of these communities followed other Rules; that others were content with substituting the responsible chapters in the rule of Aquisgran, and finally that others chose for themselves new rules. Some of these adaptations and new rules have already been mentioned here in these pages. Other documents give evidence of the presence of organized canonical lifesecundum Regulam sancti Augustini in Chapters that did not know the Rule of Augustine. In 1092 Urban II directed a Bull to the canons of Rottenbuch (Bavaria), “secundum beati Augustini Regulam viventium”, to those who still did not follow the Rule of Augustine. At the same time the founders of the Abbey of Chamouzey decided to livesecundum beati Augustini regulam. But at the hour to embrace the Rule chose that of Saint Rufo of Avignon. Also the congregation of the Holy Sepulchre in Jerusalem, founded in 1114 by the Patriarch Arnulfo of Choques, was born under Augustinian inspiration. But this did not impede them giving themselves their own statutes. The same could be said of those of Saint Quentin of Beuavais and Saint Victor of Paris. Nonetheless the text of the Augustinian Rule was already well-known and esteemed in many communities. This is shown with sufficient clarity in the manuscript B/28 of Pavia, previously cited, and the use which is made of it by Ivon of Chartres in the years 1095-1098. Also the commentary traditionally attributed to Hugo of Saint Victor and which recently some prefer to place closest to the canons of Saint Rufo of Avingnon, and the consultation of the canons of Springiersbach (1118) on the validity of certain rules of the Ordo monasterii. But its adoption as the only Rule and juridically binding ran into difficulties. It was not very clerical and above all still suffered, at least in a good number of manuscripts, as a heavy burden which halted advancement. It was the Ordo monasterii of very doubtful Augustinian origin, with very severe prescriptions on fasting, and its archaic liturgical arrangements. Only when liberated from this constraint could it make its way known among the canons. Verheijen believes that this liberation, which is the inspiration behind the actual Regula recepta, took place in the north of France and was possibly the work of Ivon of Chartres the founder and first provost of Saint Quentin. It seems this way according to the local and temporal origin of the most ancient manuscripts of the Regula recepta, some of whose textual peculiarities and customs are evident in that of Saint Quentin (27). Between 1120 and 1130 the Rule of Saint Augustine started to take the place of existing Rules and converted itself gradually into the official Rule for all the canonical communities. Not all the canons cast aside the Ordo monasterii. Those of hermetical tendency appreciated its precision and vigour, more suitable for directing their ideal of the religious life than the Præceptum, which was too general and flexible, and so they converted it into the banner of their movement. Amongst them stands out Saint Norbert (1082-1134), the austere founder of Premontre (1120) where he applied it with full rigor. He didn´t retreat, not even when faced with its evident archaic liturgical arrangements, yet was obliged to abandon it in 1126. This gave rise to a new way to be a canon, the canonical novus ordo, so called to distinguish it from the traditional or antiquus. Its distinctive characteristics were silence, austerity, seclusion, little apostolic activity and prolonged fasting, which all clashed with the restraint of the primitive rule. 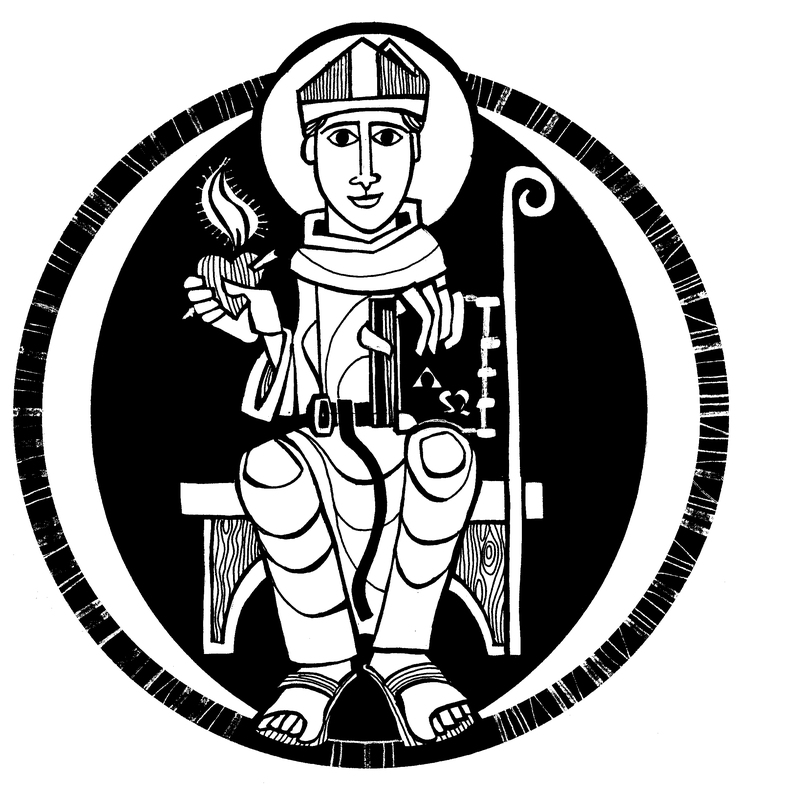 Both movements, however, agreed in considering Saint Augustine as Father and Mentor. From Innocent II onwards (1130-1142) the papal chancellery always assigned the Rule of Saint Augustine to the canonical communities. It is so much this that its presence in a community is sufficient to assure us of its canonical character. The II Council of Lateran (1139) solemnly sanctioned this process partnering it with those of Saint Benedict and Saint Basil in its canons 9 and 26 (28). With this Saint Augustine recovers an eminent position in western religious history – in the lower Middle Ages the canons regular came to be counted as some 2,500 houses scattered all over Europe – and his Rule embarked upon a brilliant course which has not yet finished. At the end of the XII and beginning of the XIII centuries various congregations dedicated to the sick, the redemption of prisoners and the predication adopted it. But not in all of them did it achieve the same meaning. In some its adoption was little more than a simple keeping up of appearances, which only served to avoid certain legal pitfalls. They had to adopt an approved Rule and that of Augustine was the most flexible. In all cases it coexisted withinstituta, consuetudines or constitutiones which limited its influence and even deformed its message. in Historia de los Agustinos Recoletos. I.
Desde los orígenes hasta el siglo XIX. (15) Eugipii regula. Ediderunt Fernandus Villegas et Adalbertus de Vogüé, Viena, csel 87, 1976. (16) See the summary of L. de Seilhac, L’utilisation par s. Césaire d’Arles de la Règle de S. Augustin, Roma 1974. (17) A catalogue and valorisation of these reminiscences in A. de Vogüé, La Règle de saint–Benoît1: Prologue–Ch. 7, París 1972, 33-39. (18) Leandro de Sevilla,De la instrucción de las vírgenes y desprecio del mundo. Translation, studies and notes by Jaime VELÁZQUEZ Madrid 1979. Another edition in Reglas monásticas de España visigoda. Los tres libros de las Sentencias. Bilingual critical edition by Julio Campos and Ismael Roca, Madrid, BAC 321, 1971. (19) M. Férotin, Le Liber Ordinum en usage dans l’Espagne wisigothique et mozarabe d’Espagne du v au xi siècles, París 1905, 60. (20) A. M. Mundó, “I ‘Corpora’ e i ‘Codices Regularum’ nella tradizione codicologica delle regole monastiche”, 482. (21) A. Linage Conde, “Introducción de la regla benedictina”, en R. García Villoslada (Dir. ), Historiade la Iglesia en España2/1, Madrid 1982, 169. A greater explanation, enlarged and with documentation in a work by the same author is Una exposición más amplia y documentada en la obra del mismo autor, Los orígenes del monacato benedictino en la Península Ibérica 2, León 1973. (23) L. Verheijen, La Règle1, 121-122, 129. (24) Daniel Missone, “La législation de saint Augustin et coutumier”, en Annales du Midi 75 (1963) 471-489 75 (1963) 471-489. (25) J. Sáenz de Aguirre, Collectio maxima conciliorum Hispaniæ 5, Roma 1755, 24. The majority of the information on the canonical expansion in Spain comes from A. Linage Conde, “Reorganización de la vida común del clero. Canónigos regulares. Premonstratenses”, en R. García Villoslada, Historia de la Iglesia en España 2/1, 406-426. (26) Esencial facts on these congregations accompanied by a more important bibliography in dip 2, 63-151. Sobre la vida canonical en Inglaterra, Polonia y Hungría, cf. La vita comune del clero nei secoli xi e xii 1, 274-303; 2, 66-79. (27) Verheijen, La Règle de St. Augustin 2, 117-124.